From Videoholic (Ray Glasser) Audio from the early days of WKBF Channel 61..Some promos, including Leonard Nimoy plugging Star Trek reruns.. This is the only known recording of anything off the old WKBF-61..
Another Analog Bites the Dust..
Of course, everyone knows about the on again, off again saga of analog-to-digital Television playing out in the USA. As the majority of the stations will sign off their analog transitters June 12, 2009. Some signed off Midnight Tuesday, February 17 (Wednesday), the original cut-off date. WNEO-45 Alliance shut off its analog station in November 2008. WMFD-68 in Mansfield, Ohio shut off it's analog in 2007. 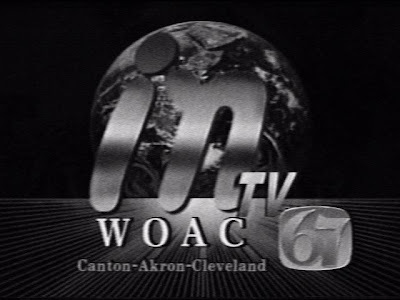 The third Northeast Ohio station to turn off it's analog signal is Multicultural Broadcasting's WOAC-TV 67, licensed to Canton but "serving" Cleveland/Akron/Canton with a blend of Informercials and some local programming..They've slowly added more local progrqamming to the mix..
Tuesday Night at about 11:55 PM during (what else) an informercial, WOAC aired the following crawl at the top of the screen..
on a visual frequency of 789.25Mhz. You can now view WOAC on it's digital channel, 47, with an average power output of 1,000KW. WOAC now leaves the air permanently. God bless you." Thanks to Ohio Media Watch reader Andrew for copying the on-screen announcement..Originally posted in a comment to Ohio Media Watch.. Thus ends a 42 year history of Canton, Ohio full power analog commercial television..WOAC first signed on in April 1982 as a full-power independent with some news and sports..Scott Davis, Sherry Lee and Son of Ghoul were major personalities for a number of years..WOAC was sold to Paxson 1n 1996 as an InTV/Worship affiliate, then to Shop at Home/Scripps in the early 2000's then to Multicultural Television of New York City in 2006. WJAN-17 was Commercial from 1967-82 before being sold to David Livingstone Foundation and eventually to TBN. This leaves WDLI-TV 17 as the last full power analog TV station licensed to Canton/Stark County..They will move to channel 39 in June..
As promised, The final few minutes and last sign-off of WOAC-Analog Channel 67...frtom musicman150 at YouTube..Thanks musicman150! From YouTube:ABC-TV Promo for the Real McCoys, about 1961..Walter Brennan starred as Grandpa Amos McCoy, who moved his family to "Sunny Cal-i-for-ni yay" from West Virginia..This was the first rural sitcom on Televison, running six years on ABC and CBS, paving the way for shows like Beverly Hillbillies, Green Acres, etc..
April 1970 TV Guide Ad for "23 Total News" featuring Jerry Healey on Sports..Healey passed away this week..
Before I go on, I want to mention briefly the passing of Jerry Healey, disc jockey for Akron's WAKR and WCUE in the 1960's to early 80s. Healey died February 3, 2009 at the City of Hope in Duarte, California...He was well known as a Morning Host at WAKR and also did sports play-by-play..Condolences to his family.. Among many internet sites I go to every day is Cleveland.com "Television" and "Listening Party" message boards..Though the conversation there is often less than stellar, to say the least. 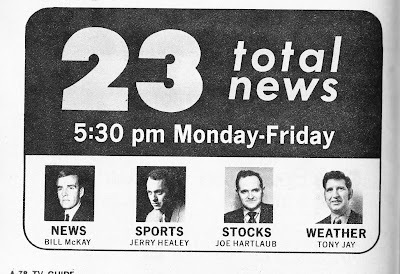 A question was brought up this morning that made me think..Over the last several months, a number of NE Ohio broadcasting legends, including Herb Score, Bill Gordon, Harry Martin and most recently, Jerry Healey..have left us..It was brought up on the Cleveland.com boards that considering how legendary these personalites were, there has been very little discussion about them, or what they meant to the radio industry or to listeners as a whole..Are we so immersed in the "here and now"..that we cant take more time to reflect on the absolute icons of the business? Also, some seem to want to focus a bit more on the negative side of some personalities.."He was ok in public but.."
While I have never been in the broadcasting business, I read enough daily to know the industry is in bad shape..But I think we still need to reflect on the greats that came before..The DJ's that didnt have to be crude to get a laugh...That could be creative and "adult" at the same time without going for gutter humor..Those that exemplified class and dignity in the profession when class and dignity meant something.. I realize I dont often "editorialize" but I felt something like this needed to be said..Have a good weekend everybody..
Today I'd like to talk a bit about what I think is a very underrated sitcom..if nothing else, because of the great theme song.. 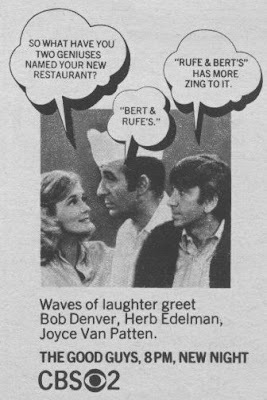 The Good Guys, starring Bob Denver, 2 years removed from Gilligan's Island and Herb Edelman as lifelong buddies who live in the same town..Edelman, as diner owner Bert Gramus and Denver as Cab Driver Rufus Butterworth, who is always coming up with Get-Rich Quick schemes, much to the chagrin of Gramus and his wife Claudia, played by Joyce Van Patten..Very much a screwball type comedy, typical of sitcoms of the 1968-70 era..The series premiered Wednesdays at 8:30 September 25, 1968 on CBS-TV..The series showed enough promise to warrant a second seasaon pickup..
Promottional ad for "The Good Guys"..Very funny bits here..
First season open/close for The Good Guys..Notice Alan Hale was the guest star in this episode, reuniting with Bob Denver..Jim Backus also appeared occsionally on this series..
David Johnson a native of Kansas City, Mo. 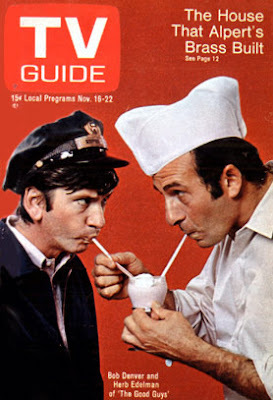 has the only "Good Guys" page on the web..Episode guides and photos from the series..